In the early days of our nation (before it was a nation), the states were colonies of Britain. Being a colony had its advantages and disadvantages. Most colonists were loyal to Britain and were happy to be under British rule, as members of colonies. Over time though, the relationship with Britain changed. Early colonists had no sense of “America.” There was no American nation, and the colonists did not feel united as a country. Their loyalties were to their own colony and to Britain. The colonists thought of themselves as Virginians or New Yorkers, not as Americans. Early on, the colonists were very loyal to Britain. For many of them, Britain was home. They depended on Britain for many things. One reason they were loyal was because the British army defended them. Settlers were worried about attacks by Native American Indians and French settlers. The British troops protected them. The colonists also traded with the British. They sold tobacco, rice, lumber, and furs to Britain. In exchange, they bought things they couldn't make or grow in the colonies, like coffee, tea, and manufactured goods. Trade with Britain was very important to the success of the colonies. Most colonies had their own government, and the British let them make their own rules. In the early days, the colonists did not even have to pay taxes to the British. Prior to 1763, the British pretty much let the colonists do what they wanted. This was called salutary neglect. This means that they did not pay much attention to the colonies. The British did have some rules, like the Navigation Acts, which said that some goods could be shipped only to Britain or its colonies. The Molasses Act put a tax on molasses bought from anyone other than the British. These taxes were not strongly enforced though. Most colonists remained loyal to British rule. Britain was not the only European country that settled in America. Spain, France, and the Dutch also had settlements. While the English primarily colonized the eastern coast of North America, the French explored the interior, including the Great Lakes region and the Mississippi Valley down through the Louisiana Territory. There were also many groups of Native Americans who had lived throughout North America for hundreds of years. One of the most important groups in the northeast were the Iroquois. In the late 1500s, five different Iroquois tribes, the Cayuga, Mohawk, Oneida, Onondaga, and Seneca, decided to join together to form a peaceful confederacy. Other important Native American groups in the north were the Delaware and the Shawnee. In the south, the Cherokee, Choctaw, Creek, and Chickasaw all had strong tribes. As the Europeans settled North America, their relationships with the Native Americans varied. In the north, the Hurons and Algonquins allied with the French and traded furs with them. The Iroquois allied with the Dutch and the English. As battles for land began among the different European groups, the Native Americans they were allied with got involved as well. During this time, Britain and France were fighting for land around the world. In Europe, this was called the Seven Years' War, because it lasted from 1756 to 1763. This war between the British and the French spread around the world. They fought in Europe, in India, and in America. In America, the war was called the French and Indian War. The conflict began when British fur traders started moving into land in the Ohio River Valley. This upset the French and Indians who were already living and trading furs in that area. This conflict over land continued, and the British went to war with the French. The war was long and hard. Many colonists volunteered to fight with the British army, but they did not have experience as soldiers. Both the British and the French tried to get the Native Americans to fight on their side. The Indians did not want the French or British to take their land. The French army was able to get many Indian groups to fight with them against the British though. This was an advantage to the French. After many lost battles, the British finally sent more troops from Europe. As the British army grew stronger, some Indians, like the Iroquois, decided to fight on the side of the British. Finally, the British won the war. In 1763, the Treaty of Paris was signed. The British took control of all land east of the Mississippi. Late in the war, Spain had joined to help the French, and as a reward, the Spanish were given control of the French land west of the Mississippi. The French were left with no land. After the war, the Native Americans were concerned that the British colonists would move onto their land. They were right, and fighting resulted. In Pontiac’s Rebellion, Native Americans responded by attacking many British forts. After that, the British issued the Proclamation of 1763. This made the land west of the Appalachian Mountains off limits to colonists, so that the Native Americans could live in peace there. The war with the French had other results as well, including that it cost the British a lot of money. After it was over, the British decided to tax the colonies more to help pay for the war. 1. In the early days of the colonies, how did Britain treat the colonies? A) The British attacked them to get the land back. B) The British gave them lots of money and supplies. C) The British mostly left them alone. D) The British taxed everything they bought or did. 2. What is salutary neglect? 3. What group of Indians had an early peace and cooperation agreement? 4. Who were the main opposing sides in the French and Indian War? 5. What was the French and Indian war fought over? 6. What ties did the colonies have to Britain before the revolution? 7. How did the French and Indian War affect the colonies? After the French and Indian War, the British made several changes in how they dealt with the colonies. It was the end of salutary neglect. These changes were not popular with the colonists. One of the first actions that angered the colonists was the Proclamation of 1763. The colonists were unhappy about this because they wanted to move to the western land. After the war, there were other disagreements between the British and the colonists. The British increased their taxes on the colonies. They needed the money because the war with the French was so expensive. The colonies did not think these taxes were fair. Two of the first taxes were the Sugar Act (1764) and the Stamp Act (1765). The Sugar Act put a tax on all imported sugar and molasses shipped into the colonies. The Stamp Act required that all official documents, like contracts, wills, and even newspapers, have a stamp that showed a tax had been paid. This tax especially made the colonists angry because it affected everyone. After the French and Indian War, the British wanted to keep soldiers in America to keep the peace. The Quartering Act said that the colonists had to provide housing for these British soldiers. This further angered the colonists. The British also punished some colonists for speaking out against them. The colonists began to protest against British actions. As their unhappiness grew, some colonists boycotted British goods. A boycott is when someone refuses to buy something as a protest. Although the British repealed some taxes, they continued to put new ones in place. The Townshend Acts of 1767 were another attempt to raise money for England. They put taxes on many imported goods, such as glass, paper, and tea. The British also wanted to crack down on smuggling, so they began issuing warrants to search colonists’ homes to look for smuggled goods. Another problem was that the colonists had no voice in the British government or in how the rules were made. This is called lack of representation. This means that the colonists had no say. They used the rallying cry “no taxation without representation,” which means that people thought that they should not have to pay taxes if they had no voice in the government. Some colonists became angry and wanted to get rid of British rule. They were called rebels or Patriots. Other colonists still thought the British were right and should rule. These people were called Loyalists. The colonies did not agree about what to do. By 1770, protests heated up. In Boston, a mob of colonists was protesting, and British soldiers fired on them. Five colonists were killed. This was called the Boston Massacre. Some thought the British were at fault, but others didn't. Bad feelings about the British grew though. The British continued to tighten their rule over the colonies, and the colonists continued to protest. In November, 1773, colonists dressed like Indians as a disguise, boarded a British ship, and threw its cargo of tea into the harbor. This was called the Boston Tea Party. These protests increased the feelings of conflict between the British and the colonists. They were moving toward war. In 1774, Britain passed a series of laws to punish the colonists for their protests. The British called these the Coercive Acts, but the colonists called them the Intolerable Acts because they were so awful. These acts tried to force the colonists to pay for damage they had done and to control them more closely to avoid future protests. Britain also made General Thomas Gage the governor of the colonies to enforce these laws. This was another example of the British trying to gain more control. These actions enraged the colonists. Several colonial leaders began to emerge. Sam Adams lived in Boston and was a part of a group called the Sons of Liberty. This was a secret group of patriots who planned protests against the British. Another member of the Sons of Liberty was silversmith Paul Revere. Revere was most likely involved in both the Boston Massacre and the Boston Tea Party. He made a famous engraving of the Boston Massacre, shown below. In September, 1774, a group of leaders met in Philadelphia for the First Continental Congress. They had different opinions about how to resolve the conflict with Britain. They decided to send a petition to the King of Britain listing their complaints. Included among the group were Sam Adams and George Washington. These leaders agreed to meet again the following year. In the meantime, Britain sent additional troops to the colonies. War was about to begin. 8. Why were the Sugar Act, Stamp Act, and Townshend Acts passed? 9. What does “no taxation without representation” mean? A) The colonists should have their own elections and taxes. B) The colonists should not be subject to rules that they didn’t have a vote on. C) Britain should go away and leave the colonists alone. D) There should be no taxes. 10. What were the colonists who wanted independence called? 11. Which of these was not a leader in the Patriots? 12. What were the changes in British rule that caused the colonies to protest? 13. Imagine you were a Loyalist in the colonies. How would you try to convince others that war wasn’t a good solution? 14. Imagine you were a Patriot in the colonies. How would you try to convince others that the colonies should be independent? 15. List three causes of the American Revolution. In April of 1775, the first shots of the American Revolution were fired at Lexington and Concord in Massachusetts. The British had heard that the colonists were storing guns in Concord. General Gage ordered the arrest of Sam Adams and John Hancock in nearby Lexington. The Sons of Liberty learned of this and sent word with Paul Revere and others to warn them. When the British arrived at Lexington, the Patriots were ready. No one knows who fired first, but war had broken out. Just after that, on May 10, 1775, the Second Continental Congress met. While they still hoped that peace could be found, it did not seem likely. George Washington was asked to lead the Continental Army to fight against the British. In July, 1776, British troops gathered in New York, and Washington took his army there to defend the city. The British army had the advantage of more troops and a navy. The Patriots fought bravely but were defeated eventually and driven north out of the city. Tired and defeated, they crossed the Delaware River into Pennsylvania. The colonists were at a disadvantage in this war. They didn't have as big of an army as the British, and the colonial troops were not experienced. The long, cold winters were difficult for the troops. They didn't have enough food or clothing. There were also some colonists, the Loyalists, who didn't support the war. However, the Patriots had a strong spirit. This made them fight hard despite the conditions. On Christmas Day, 1776, Washington decided to launch a surprise attack against the British in Trenton, New Jersey. He hoped that they wouldn’t expect an attack on the holiday. The weather was freezing and icy, and troops that were supposed to meet up with Washington’s army didn’t make it. Despite this, though, Washington’s army was successful with their surprise attack and captured and killed many British, while sustaining few casualties of their own. Washington and his troops stayed on for another week. The British gathered more troops and planned to attack Washington’s troops on January 3, but they got away. Washington then went on to win another battle in Princeton, New Jersey. These victories helped the Patriots to attract more soldiers to their cause. In 1777, the British had a plan to send three armies to march to Albany, New York. By seizing the Hudson River valley, the British could gain a big advantage. One of armies, led by British General Howe, broke off though. He succeeded in capturing the city of Philadelphia but left the other two armies on their own. In September and October, the Patriots and the British fought several battles, known collectively as the Battles of Saratoga. Benedict Arnold (who would later become known as a traitor to the Patriots after he switched his loyalty) was a hero and led several successful attacks against the British. The exhausted British retreated to a fort at Saratoga, which the Patriots surrounded and attacked. The British surrendered. This is seen as a turning point in the overall war. Washington took his army to Valley Forge that winter. They spent a long, cold winter there without enough supplies. Many soldiers died during the winter. Early in the war, the French had given secret aid to the Americans. They wanted the British to be defeated. In 1778, after the Americans proved that they could win battles, the French agreed to fight with them. The French signed two treaties with America and recognized the country's independence. They provided the Americans with much-needed supplies and troops. They also convinced Spain to side with the Americans. In 1778, the British troops moved to the south, where there were fewer Patriots and fewer colonial troops. The British also promised southern slaves their freedom if they would fight with the British army. In December, 1778, the British captured Savannah, Georgia, which they used as base to take much of the south. The British army went on to lay siege to and ultimately capture Charleston, South Carolina, in one of the worst defeats for the Americans. The fighting continued, and by 1781, the war was focused on Virginia. British General Corwallis moved a large number of British troops to Yorktown, Virginia. Washington headed there with his troops and was met by French troops and 29 ships in the French navy. This set the state for the Battle of Yorktown. There was a great naval battle between French and British warships. The French won, forcing the British ships to retreat to New York for reinforcements. The French ships were then able to cut Cornwallis and his troops off from a retreat. Aided by the French, Washington and his troops began a siege on Yorktown. In mid-October, 1781, Cornwallis and the British surrendered. The Americans had won the war! Throughout the war, the American Patriot forces were outnumbered by the British. The Americans had little experience and poor supplies, yet they won the war. There were many reasons for this. First, they strongly believed in their cause of American independence. This often motivated the troops to keep fighting when they might otherwise have given up. The Americans also had excellent leadership. The troops especially respected George Washington and, because of him, were willing to keep fighting despite awful circumstances. Finally the Americans were assisted by the French and Spanish. In the final stages of the war in particular, French troops, supplies, and leadership helped America win the war. American borders were established with the Mississippi River being the western edge. The Mississippi River would be open to both Britain and America. Americans were given fishing rights off of, but not in, Newfoundland. Creditors on both sides would be able to collect debts. America would recommend that its states repeal confiscation laws and give property back to the British and Loyalists. No one would be prosecuted or held in confinement for their part in the war. America had won its independence! Now the hard work of creating a government for the new nation would begin. 16. Where were the first shots of the revolution fired? 17. Which battle was viewed as a turning point in the war, when the Americans started being successful? 18. After which battle did Cornwallis and the British surrender? 19. Which of these was not a reason the Americans won the war? A) They had good leadership. B) They were motivated by a strong cause. C) They had more troops. D) The French helped them. 20. Write a short summary of what the Declaration of Independence said. 21. Choose one battle in the Revolutionary War that was particularly significant and do more research on it. Write a paragraph describing what happened and why it was important. 22. How were the Indians and black slaves used during the war? 23. What advantages and disadvantages did the colonial troops have over the British troops in the American Revolution? 1754 - The French and Indian War begins in America. 1763 - Britain and France sign the Treaty of Paris, ending the French and Indian War. 1764 - The British pass the Sugar Act. This taxed sugar and molasses imported from non-British countries. 1765 - The British pass the Stamp Act. This required a British stamp be put on all newspapers and legal documents. The colonists had to pay a tax for these stamps. 1766 – The Stamp Act is repealed. 1767 - The Townshend Acts are passed, taxing colonial imports. 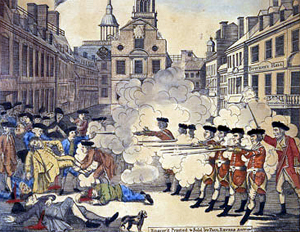 1770 - Five colonists are killed by British soldiers in the Boston Massacre. 1770 – The Townshend Acts are repealed. 1773 - The British pass the Tea Act. November, 1773 - Colonists stage the Boston Tea Party. They dress up like Indians, sneak on to British ships, and dump boxes of tea into the harbor to protest against the Tea Act. 1774 – The Coercive Acts or Intolerable Acts are passed. September, 1774 - The First Continental Congress meets in Philadelphia. April, 1775 - The first gunshots are fired in Lexington and Concord, Massachusetts, beginning the American Revolution. May, 1775 - The Second Continental Congress meets in Philadelphia. Fall, 1776 – The British drive Washington out of New York. December, 1776 – Washington is successful in battles at Trenton and Princeton. September, 1777 – The Americans win the Battles of Saratoga, marking a turning point in the war. 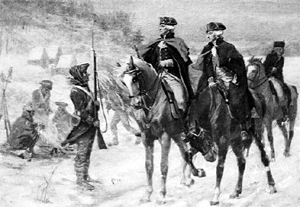 Winter, 1777-1778 – Washington and his troops spend a difficult winter at Valley Forge. 1778 – The French formally enter the war to fight on the side of the Americans. December, 1778 – The British capture Savannah, Georgia. May, 1780 – The British capture Charleston, South Carolina. October, 1781 - British troops surrender at Yorktown, Virginia. 1783 - The British and the United States sign the Treaty of Paris. 1 – Revere, Paul. "The Bloody Massacre Perpetrated in King Street Boston on March 5th 1770 by a Party of the 29th REGT." 1770. 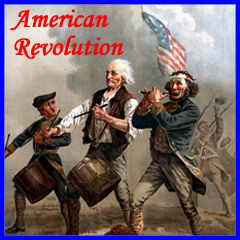 “AmericanRevolution.com.” December, 2007. < http://www.americanrevolution.com>. “Continental Congress.” Encarta. December, 2007. < http://encarta.msn.com/encyclopedia_761567004/Continental_Congress.html>. Garcia, Jesus, et al. Creating America: A History of the United States. Evanston, IL: McDougal Littell, 2002. Washburn, Wilcomb. “Indians and the American Revolution.” AmericanRevolution.org. December, 2007. <http://www.americanrevolution.org/ind1.html>.